The previous SPYRAL (Basic Combo) article showcased 4 commonly used and executed combos in the OCG 2017.10 SPYRAL deck. The strength of SPYRAL lies in their consistency. They have multiple different combinations to achieve a potentially game-winning opening board. This article will showcase four additional 2-card combos for SPYRAL. These combos occur less frequently as they require a card that is limited. Special Summon Blackwing – Gofu the Vague Shadow from hand. When Blackwing – Gofu the Vague Shadow is successfully summoned, trigger its effect to Special Summon 2 “Vague Shadow Token”. Using 1 “Vague Shadow Token”, Link Summon Linkuriboh. When SPYRAL Quik-Fix is successfully summoned, trigger its effect to add SPYRAL GEAR – Big Red from deck to hand. 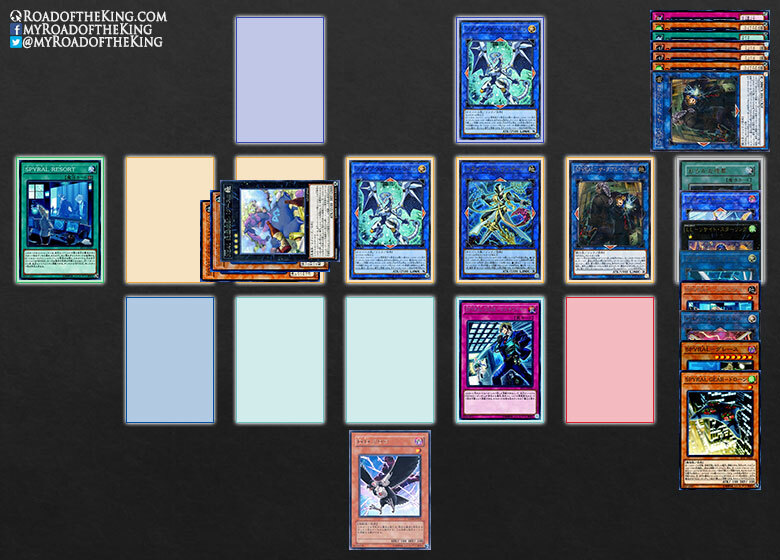 Using Blackwing – Gofu the Vague Shadow + “Vague Shadow Token” + Linkuriboh + SPYRAL Quik-Fix, Link Summon Saryuja Skull Dread in the Right Extra Monster Zone. When Saryuja Skull Dread is successfully summoned, trigger its “● 4:” effect to draw 4 cards, then place 3 cards on the bottom of the Deck. Activate SPYRAL GEAR – Big Red, revive SPYRAL Quik-Fix. When SPYRAL Quik-Fix is successfully summoned, trigger its effect to add SPYRAL GEAR – Drone from deck to hand. Activate the “● 3+:” effect of Saryuja Skull Dread, Special Summon SPYRAL GEAR – Drone from hand. When SPYRAL GEAR – Drone is successfully summoned, trigger its effect to look and reorder the top 3 cards of the opponent’s deck. 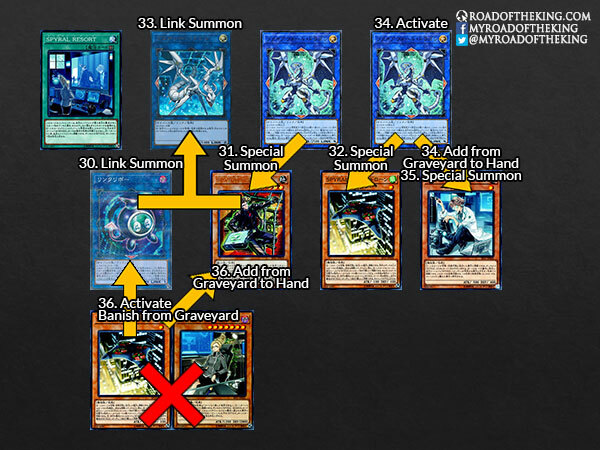 Using SPYRAL Quik-Fix + SPYRAL GEAR – Drone, Link Summon SPYRAL Double Helix in the 5th Main Monster Zone. Activate the effect of SPYRAL Double Helix, Special Summon SPYRAL Master Plan from deck. Activate the effect of SPYRAL Master Plan, add SPYRAL MISSION – Rescue from deck to hand. 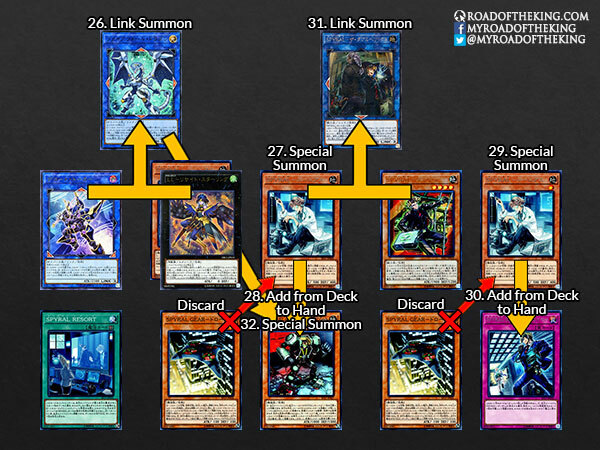 Using SPYRAL Double Helix + SPYRAL Master Plan, Link Summon Decode Talker in the 3rd Main Monster Zone. As SPYRAL Master Plan was sent to the graveyard, trigger its effect to add SPYRAL Resort and SPYRAL Super Agent from deck to hand. Play and activate SPYRAL Resort, add SPYRAL Quik-Fix from deck to hand. Activate the effect of SPYRAL Super Agent, Special Summon itself from hand in the 2nd Main Monster Zone (left of Decode Talker). Activate the effect of SPYRAL Quik-Fix in the graveyard, discard SPYRAL Quik-Fix, and revive itself. Activate the effect of the other SPYRAL Quik-Fix in the graveyard, discard SPYRAL MISSION – Rescue, and revive itself. Using SPYRAL Quik-Fix + SPYRAL Quik-Fix, Xyz Summon Lyrilusc – Recital Starling in the 4th Main Monster Zone (below Saryuja Skull Dread). When Lyrilusc – Recital Starling is successfully summoned, trigger its effect to +600 ATK/DEF to Saryuja Skull Dread. Activate the effect Lyrilusc – Recital Starling, detach 1 Xyz Material, and add D.D. Crow from deck to hand. Using Decode Talker + Lyrilusc – Recital Starling, Link Summon Firewall Dragon in the 3rd Main Monster Zone (right of SPYRAL Super Agent). 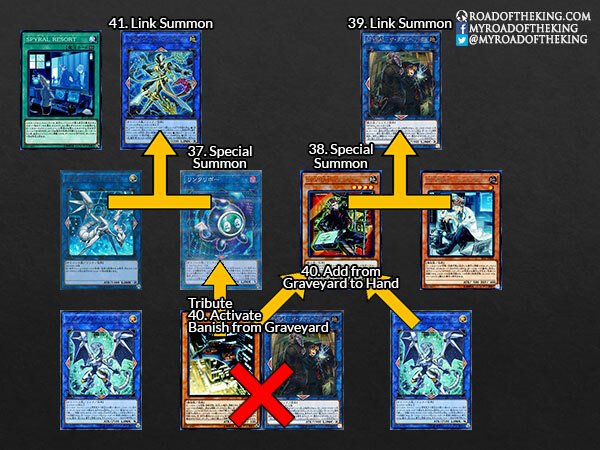 Activate the effect of SPYRAL Quik-Fix in the graveyard, discard SPYRAL GEAR – Drone, and revive itself in the 1st Main Monster Zone (left of SPYRAL Super Agent). When SPYRAL Quik-Fix is successfully summoned, trigger its effect to add SPYRAL GEAR – Last Resort from deck to hand. Activate the effect of the other SPYRAL Quik-Fix in the graveyard, discard SPYRAL GEAR – Drone, and revive itself in the 5th Main Monster Zone. When SPYRAL Quik-Fix is successfully summoned, trigger its effect to add SPYRAL GEAR – Utility Wire from deck to hand. 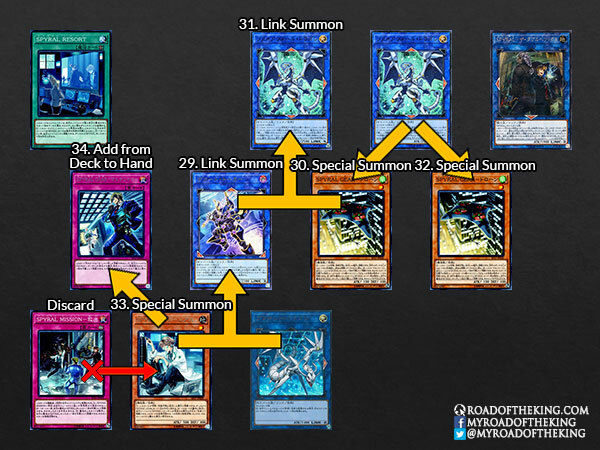 Using SPYRAL Quik-Fix (in the 1st Main Monster Zone) + SPYRAL Super Agent, Link Summon SPYRAL Double Helix in the 4th Main Monster Zone (right of Firewall Dragon). As SPYRAL Super Agent that Firewall Dragon was pointing to was sent to the graveyard, trigger the effect of Firewall Dragon, and Special Summon SPYRAL GEAR – Last Resort from hand in the 1st Main Monster Zone. Activate the effect of SPYRAL GEAR – Drone in the graveyard, banish itself and SPYRAL GEAR – Big Red, and add SPYRAL Super Agent from graveyard to hand. Using SPYRAL Quik-Fix + SPYRAL Double Helix, Link Summon Tri-Gate Wizard in the 4th Main Monster Zone (below Saryuja Skull Dread). 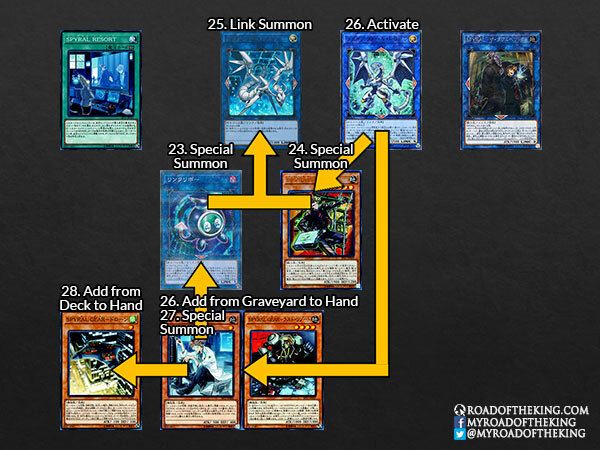 As SPYRAL Double Helix that Firewall Dragon was pointing to was sent to the graveyard, trigger the effect of Firewall Dragon, and Special Summon SPYRAL Super Agent from hand. Using SPYRAL GEAR – Last Resort + SPYRAL Super Agent, Xyz Summon Number 41: Bagooska the Terribly Tired Tapir in the 2nd Main Monster Zone (left of Firewall Dragon). Activate the effect of SPYRAL MISSION – Rescue in the graveyard, banish itself, and revive SPYRAL Double Helix in the 5th Main Monster Zone (right of Tri-Gate Wizard). Number 41: Bagooska the Terribly Tired Tapir in Defense Position to change Effect Monsters to Defense Position and negate their activated effects on the field. Tri-Gate Wizard co-linked to 3 monsters to negate a card or effect activation. Firewall Dragon co-linked to 1 monster to bounce 1 opponent’s monster or add 1 card from graveyard to hand. SPYRAL GEAR – Utility Wire set on the field to return 1 opponent’s card to the top of their deck. There is also a D.D. Crow in hand for graveyard disruption. The additional card drawn from Saryuja Skull Dread is also likely to be an actual disruptive Trap card or “Hand Trap”. The “● 2+:” effect of Saryuja Skull Dread is a mandatory Trigger Effect that would activate whenever a monster is summoned into a zone that it points to. These mandatory triggers were not mentioned in the above steps, so Firewall Dragon, Tri-Gate Wizard and SPYRAL Double Helix would have a +300 ATK/DEF increase. Activate Foolish Burial, send SPYRAL Master Plan from deck to graveyard. Activate SPYRAL GEAR – Big Red, revive SPYRAL Master Plan. 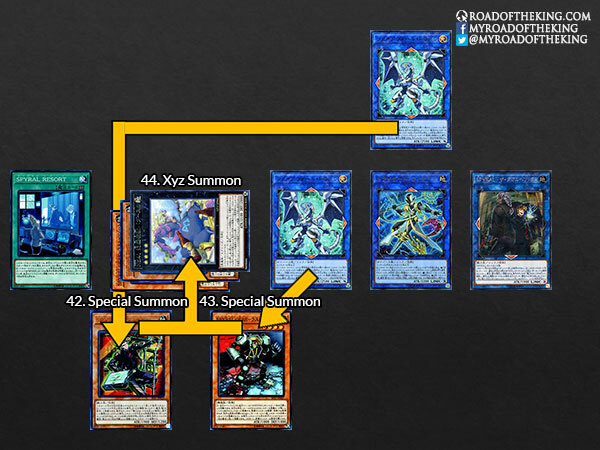 Using SPYRAL Quik-Fix + SPYRAL Master Plan, Link Summon SPYRAL Double Helix in the Right Extra Monster Zone. Activate the effect of SPYRAL Super Agent. Activate the effect of SPYRAL Double Helix, Special Summon SPYRAL Quik-Fix from deck in the 4th Main Monster Zone (below SPYRAL Double Helix). Activate the effect of SPYRAL Quik-Fix in the graveyard, discard SPYRAL MISSION – Rescue, and revive itself. 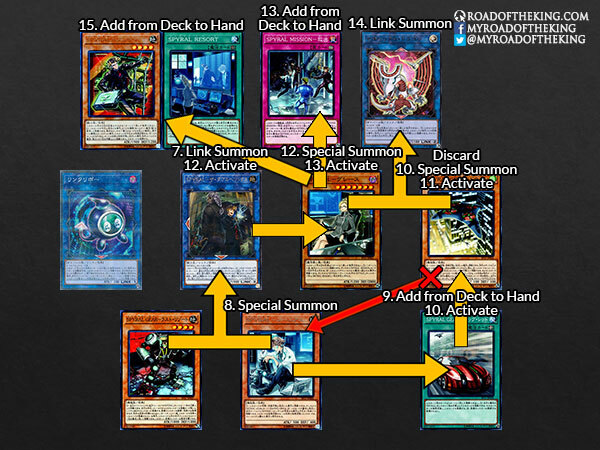 Using SPYRAL Double Helix + SPYRAL Quik-Fix, Link Summon Decode Talker in the Right Extra Monster Zone. Activate the effect of SPYRAL MISSION – Rescue in the graveyard, banish itself, and revive SPYRAL Double Helix in the 4th Main Monster Zone (below Decode Talker). Using SPYRAL Quik-Fix + Decode Talker, Link Summon Firewall Dragon in the 3rd Main Monster Zone (left of SPYRAL Double Helix). Activate the effect of the other SPYRAL Quik-Fix in the graveyard, discard SPYRAL Super Agent, and revive itself. Using SPYRAL Quik-Fix + SPYRAL Quik-Fix, Xyz Summon Lyrilusc – Recital Starling in the 2nd Main Monster Zone (left of Firewall Dragon). When Lyrilusc – Recital Starling is successfully summoned, trigger its effect to +600 ATK/DEF to Firewall Dragon. Activate the effect of SPYRAL Quik-Fix in the graveyard, discard SPYRAL GEAR – Drone, and revive itself. When SPYRAL Quik-Fix is successfully summoned, trigger its effect to add SPYRAL GEAR – Utility Belt from deck to hand. 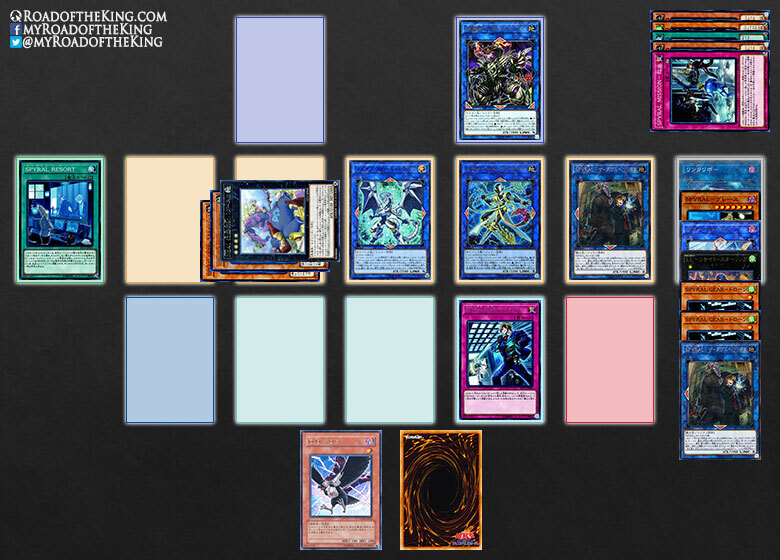 Using SPYRAL Quik-Fix + SPYRAL Double Helix + Lyrilusc – Recital Starling, Link Summon Firewall Dragon in the Right Extra Monster Zone. As SPYRAL Double Helix that Firewall Dragon was pointing to was sent to the graveyard, trigger the effect of Firewall Dragon, and Special Summon SPYRAL GEAR – Drone from hand in the 4th Main Monster Zone (below Firewall Dragon). 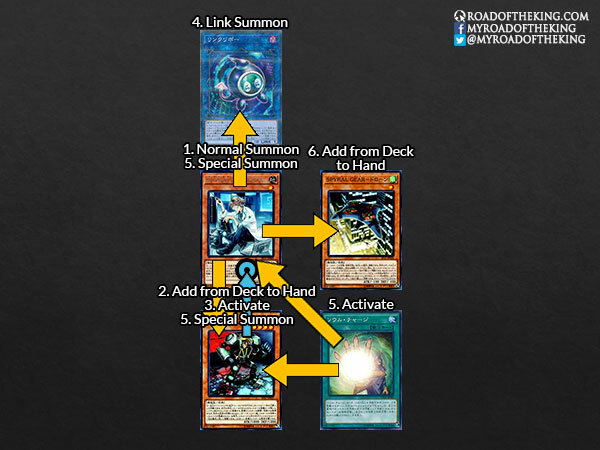 Using SPYRAL GEAR – Drone, Link Summon Linkuriboh in the 4th Main Monster Zone (below Firewall Dragon). As SPYRAL GEAR – Drone that both Firewall Dragons were pointing to was sent to the graveyard, trigger the effect of both Firewall Dragons, forming a Chain. Chain 2: Resolve the effect of Firewall Dragon, Special Summon SPYRAL Super Agent from hand in the 1st Main Monster Zone. Chain 1: Resolve the effect of Firewall Dragon, Special Summon SPYRAL GEAR – Drone from hand in the 2nd Main Monster Zone (left of Firewall Dragon). 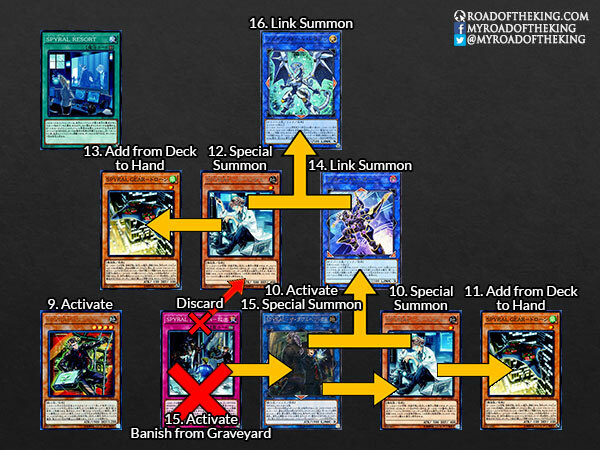 Using Linkuriboh + SPYRAL Super Agent, Link Summon Proxy Dragon in the 4th Main Monster Zone (below Firewall Dragon). 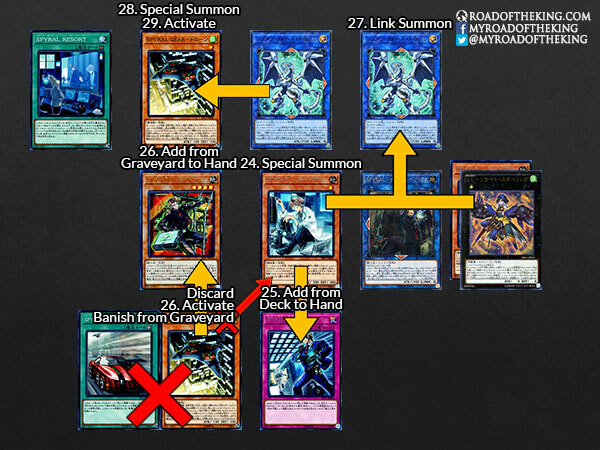 As Linkuriboh that Firewall Dragon was pointing to was sent to the graveyard, trigger the (2)nd effect of Firewall Dragon, and Chain with the (1)st effect of the Firewall Dragon in the 3rd Main Monster Zone. 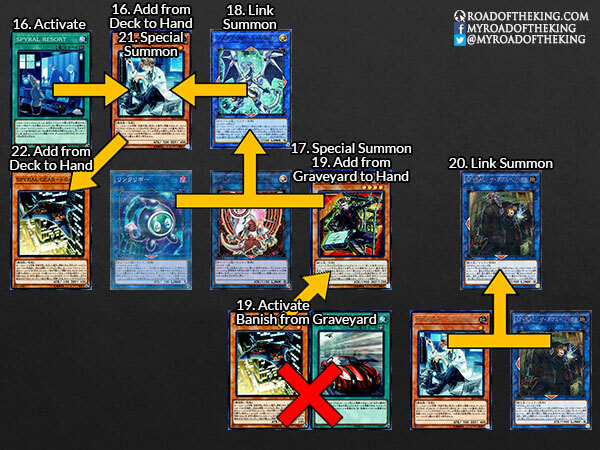 Chain 2: Resolve the (1)st effect of Firewall Dragon, add SPYRAL Quik-Fix from graveyard to hand. Chain 1: Resolve the effect of Firewall Dragon, Special Summon SPYRAL Quik-Fix from hand in the 5th Main Monster Zone (right of Proxy Dragon). Activate the effect of SPYRAL GEAR – Drone in the graveyard, banish itself and SPYRAL Master Plan, and add SPYRAL Super Agent from graveyard to hand. Activate the effect of Linkuriboh in the graveyard, tribute SPYRAL GEAR – Drone, and revive itself in the 1st Main Monster Zone. As SPYRAL GEAR – Drone that Firewall Dragon was pointing to was sent to the graveyard, trigger the effect of Firewall Dragon, and Special Summon SPYRAL Super Agent from hand in the 2nd Main Monster Zone (left of Firewall Dragon). Using SPYRAL Super Agent + SPYRAL Quik-Fix, Link Summon SPYRAL Double Helix in the 5th Main Monster Zone (right of Proxy Dragon). 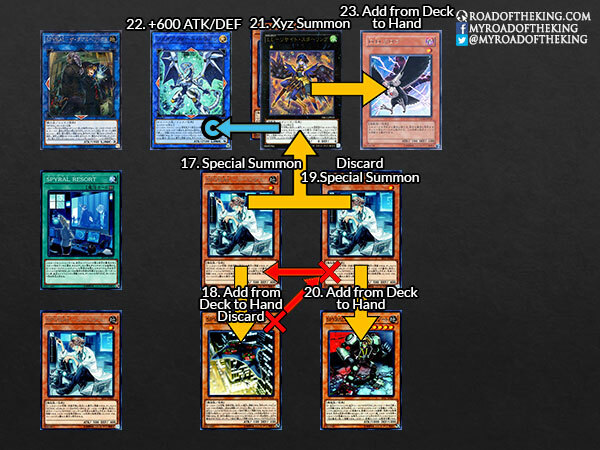 Activate the effect of SPYRAL GEAR – Drone in the graveyard, banish itself and SPYRAL Double Helix, and add SPYRAL Super Agent from graveyard to hand. 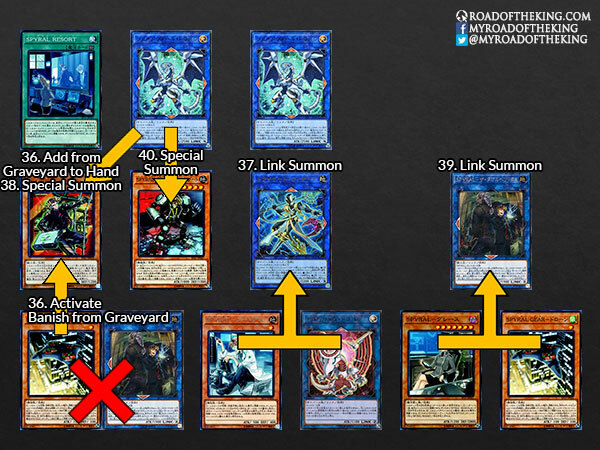 Using Proxy Dragon + Linkuriboh, Link Summon Tri-Gate Wizard in the 4th Main Monster Zone (below Firewall Dragon). As Proxy Dragon that both Firewall Dragons were pointing to was sent to the graveyard, trigger the effect of both Firewall Dragons, forming a Chain. 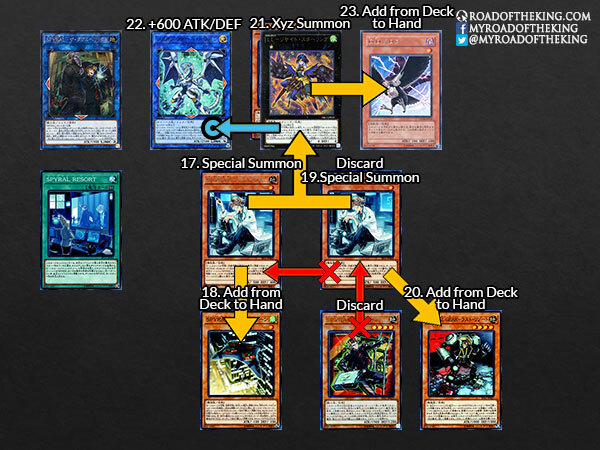 Chain 2: Resolve the effect of Firewall Dragon, Special Summon SPYRAL Super Agent from hand. Chain 1: Resolve the effect of Firewall Dragon, Special Summon SPYRAL GEAR – Last Resort from hand. Using SPYRAL Super Agent + SPYRAL GEAR – Last Resort, Xyz Summon Number 41: Bagooska the Terribly Tired Tapir in the 2nd Main Monster Zone (left of Firewall Dragon). The Firewall Dragon in the 3rd Main Monster Zone had used up its (1)st effect. The main trick in this combo is to utilize SPYRAL Super Agent to verify the top card of the opponent’s deck, so that SPYRAL Double Helix would be able to declare the correct card type. Activate the effect of SPYRAL Super Agent, Special Summon itself from hand in the 2nd Main Monster Zone. Activate the effect of SPYRAL Quik-Fix in the graveyard, discard SPYRAL MISSION – Rescue, and revive itself in the 1st Main Monster Zone. Using SPYRAL Double Helix + SPYRAL Quik-Fix (in the 4th Main Monster Zone), Link Summon Decode Talker in the Right Extra Monster Zone. Using SPYRAL Super Agent + Decode Talker, Link Summon Firewall Dragon in the 3rd Main Monster Zone (left of SPYRAL Double Helix). Activate the effect of SPYRAL Quik-Fix in the graveyard, discard SPYRAL Quik-Fix, and revive itself in the 2nd Main Monster Zone. Using SPYRAL Quik-Fix + SPYRAL Quik-Fix (in the 2nd and 5th Main Monster Zone), Xyz Summon Lyrilusc – Recital Starling in the 2nd Main Monster Zone (left of Firewall Dragon). Activate the effect of SPYRAL Quik-Fix in the graveyard, discard SPYRAL GEAR – Drone, and revive itself in the 5th Main Monster Zone. Using Lyrilusc – Recital Starling + SPYRAL Quik-Fix in the 5th Main Monster Zone, Xyz Summon Proxy Dragon in the 2nd Main Monster Zone (left of Firewall Dragon). As Lyrilusc – Recital Starling that Firewall Dragon was pointing to was sent to the graveyard, trigger the (2)nd effect of Firewall Dragon, and Chain with the (1)st effect of the Firewall Dragon in the 3rd Main Monster Zone. 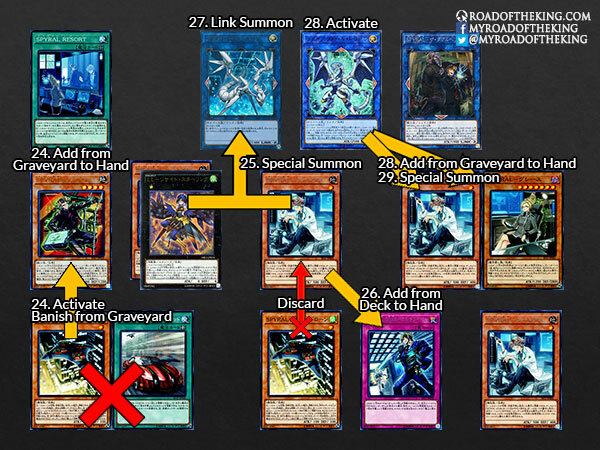 Chain 2: Resolve the (1)st effect of Firewall Dragon, add SPYRAL Quik-Fix and SPYRAL Master Plan from graveyard to hand. Chain 1: Resolve the effect of Firewall Dragon, Special Summon SPYRAL Quik-Fix from hand in the 5th Main Monster Zone. 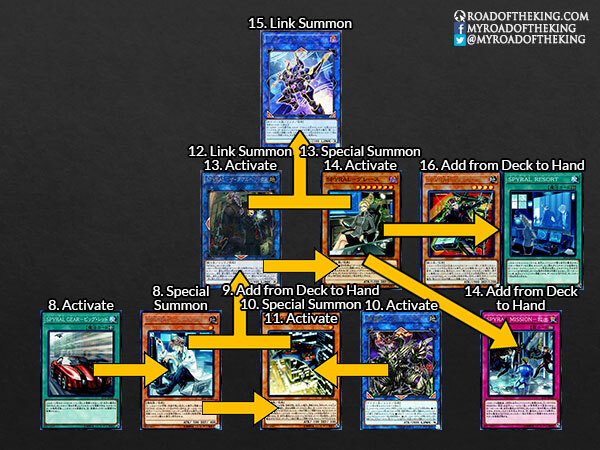 Using Proxy Dragon + SPYRAL Double Helix, Link Summon Firewall Dragon in the Right Extra Monster Zone. As SPYRAL Double Helix that Firewall Dragon was pointing to was sent to the graveyard, trigger the effect of Firewall Dragon, and Special Summon SPYRAL Super Agent from hand in the 4th Main Monster Zone (below Firewall Dragon). 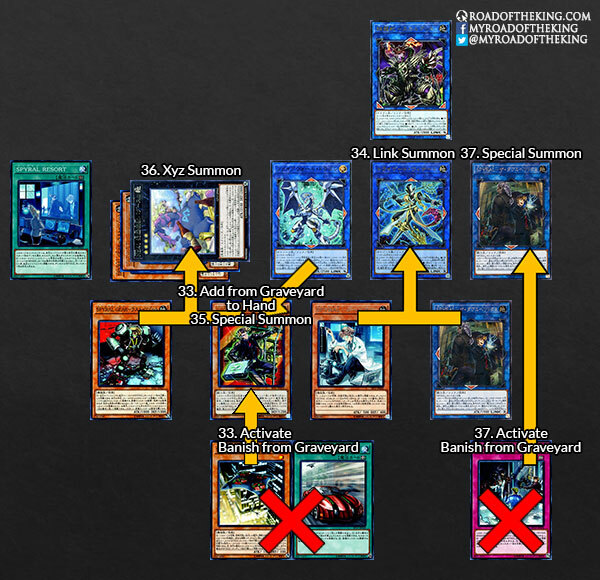 Using SPYRAL Super Agent + SPYRAL Quik-Fix (in the 5th Main Monster Zone), Link Summon Security Dragon in the 4th Main Monster Zone (below Firewall Dragon). As SPYRAL Super Agent that both Firewall Dragons were pointing to was sent to the graveyard, trigger the effect of both Firewall Dragons, forming a Chain. Chain 2: Resolve the effect of Firewall Dragon, Special Summon SPYRAL Master Plan from hand in the 2nd Main Monster Zone. Chain 1: Resolve the effect of Firewall Dragon, Special Summon SPYRAL GEAR – Drone from hand in the 5th Main Monster Zone. 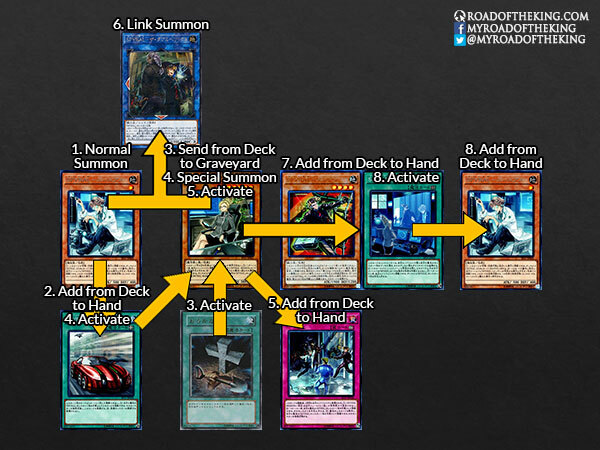 Using SPYRAL Quik-Fix + Security Dragon, Link Summon Tri-Gate Wizard in the 4th Main Monster Zone (below Firewall Dragon). As Security Dragon that Firewall Dragon was pointing to was sent to the graveyard, trigger the effect of Firewall Dragon, Special Summon SPYRAL Super Agent from hand. Using SPYRAL Master Plan + SPYRAL GEAR – Drone, Link Summon SPYRAL Double Helix in the 5th Main Monster Zone (right of Tri-Gate Wizard). As SPYRAL Master Plan that Firewall Dragon was pointing to was sent to the graveyard, trigger the effect of Firewall Dragon, Special Summon SPYRAL GEAR – Last Resort from hand. Using SPYRAL Super Agent + SPYRAL GEAR – Last Resort, Xyz Summon Number 41: Bagooska the Terribly Tired Tapir in Defense Position in the 2nd Main Monster Zone (left of Firewall Dragon). This is the alternative route for Combo 6A, where SPYRAL Super Agent managed to Special Summon itself. Activate SPYRAL GEAR – Last Resort, equip to SPYRAL Quik-Fix. 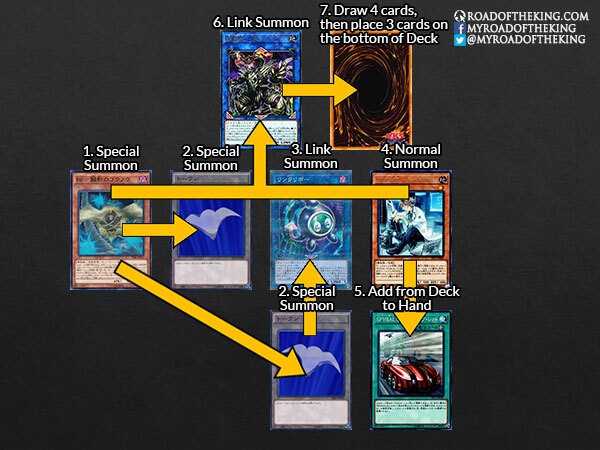 Using SPYRAL Quik-Fix, Link Summon Linkuriboh in the Right Extra Monster Zone. Activate Soul Charge, revive SPYRAL Quik-Fix and SPYRAL GEAR – Last Resort, taking 2000 damage. Using SPYRAL Quik-Fix + SPYRAL GEAR – Last Resort, Link Summon SPYRAL Double Helix in the 4th Main Monster Zone (below Linkuriboh). Activate the effect of SPYRAL Quik-Fix in the graveyard, discard SPYRAL GEAR – Drone, and revive itself in the 1st Main Monster Zone. Activate SPYRAL GEAR – Big Red, revive SPYRAL GEAR – Drone. Using SPYRAL Master Plan + SPYRAL GEAR – Drone, Link Summon Security Dragon in the 3rd Main Monster Zone (left of SPYRAL Double Helix). Using Linkuriboh + Security Dragon + SPYRAL Super Agent, Link Summon Firewall Dragon in the 3rd Main Monster Zone (left of SPYRAL Double Helix). Using SPYRAL Quik-Fix + SPYRAL Double Helix, Link Summon SPYRAL Double Helix in the 4th Main Monster Zone (right of Firewall Dragon). As SPYRAL Double Helix that Firewall Dragon was pointing to was sent to the graveyard, trigger the effect of Firewall Dragon, and Special Summon SPYRAL Quik-Fix from hand in the 2nd Main Monster Zone (left of Firewall Dragon). 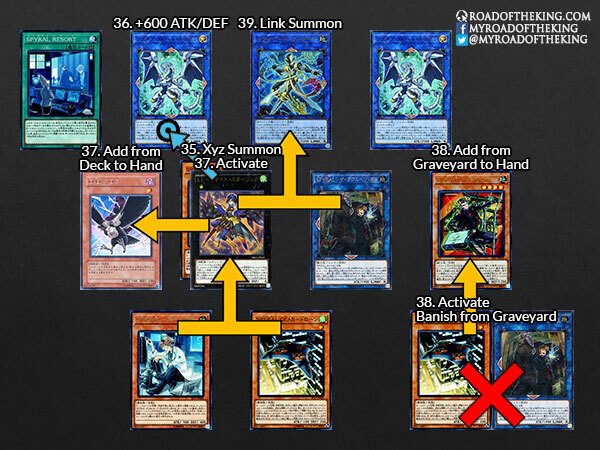 Activate the effect of Linkuriboh in the graveyard, tribute SPYRAL Quik-Fix, and revive itself in the 2nd Main Monster Zone (left of Firewall Dragon). As SPYRAL Quik-Fix that Firewall Dragon was pointing to was sent to the graveyard, trigger the effect of Firewall Dragon, and Special Summon SPYRAL Super Agent from hand in the 1st Main Monster Zone. 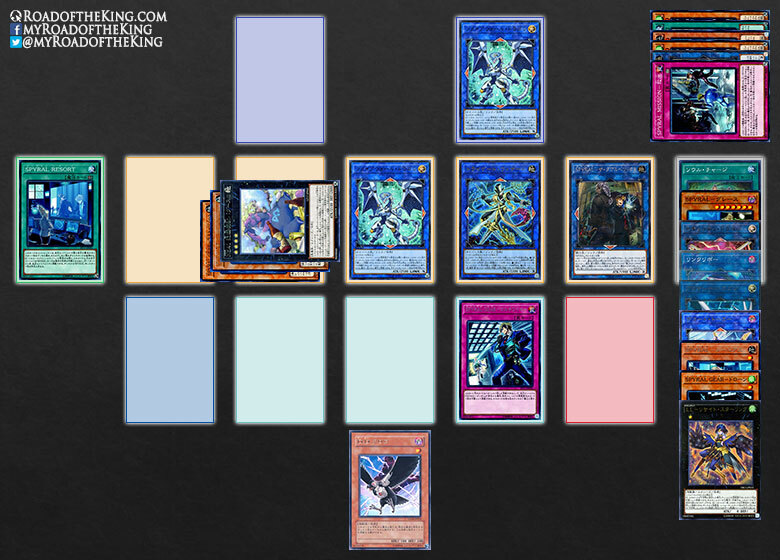 Using Linkuriboh + SPYRAL Super Agent, Link Summon Proxy Dragon in the 2nd Main Monster Zone (left of Firewall Dragon). 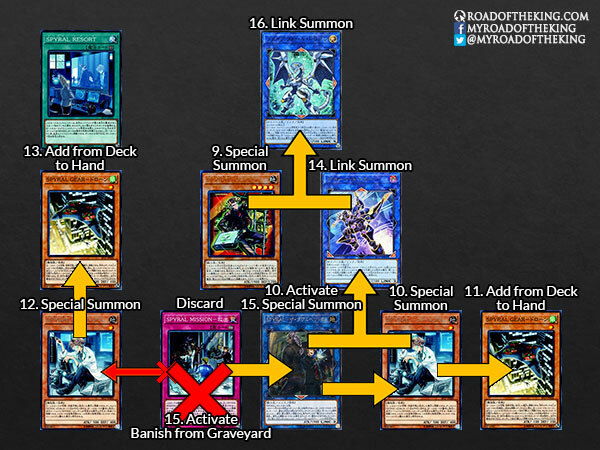 Chain 2: Resolve the (1)st effect of Firewall Dragon, add SPYRAL Quik-Fix and SPYRAL GEAR – Last Resort from graveyard to hand. Chain 1: Resolve the effect of Firewall Dragon, Special Summon SPYRAL Quik-Fix from hand in the 1st Main Monster Zone (left of Proxy Dragon). Using SPYRAL Quik-Fix + Proxy Dragon, Link Summon Decode Talker in the 2nd Main Monster Zone (left of Firewall Dragon). As Proxy Dragon that Firewall Dragon was pointing to was sent to the graveyard, trigger the effect of Firewall Dragon, and Special Summon SPYRAL GEAR – Drone from hand. 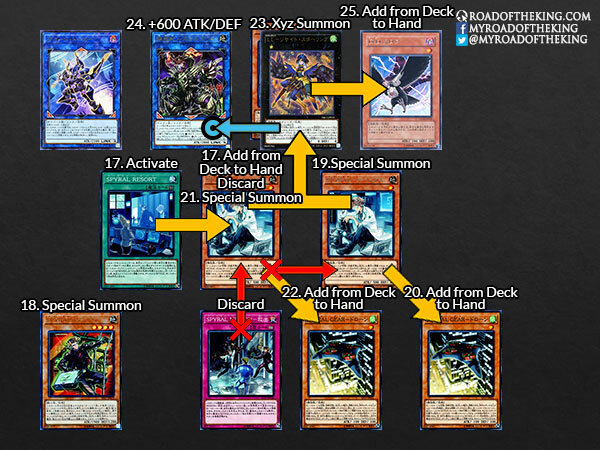 Using Decode Talker + SPYRAL GEAR – Drone, Link Summon Firewall Dragon in the Right Extra Monster Zone. As Decode Talker that Firewall Dragon was pointing to was sent to the graveyard, trigger the effect of Firewall Dragon, and Special Summon SPYRAL GEAR – Drone from hand in the 1st Main Monster Zone. Activate the effect of SPYRAL Quik-Fix in the graveyard, discard SPYRAL MISSION – Rescue, and revive itself in the 2nd Main Monster Zone. Using SPYRAL Quik-Fix + SPYRAL GEAR – Drone, Xyz Summon Lyrilusc – Recital Starling in the 2nd Main Monster Zone (left of Firewall Dragon). When Lyrilusc – Recital Starling is successfully summoned, trigger its effect to +600 ATK/DEF to one of the Firewall Dragon. Using Lyrilusc – Recital Starling + SPYRAL Double Helix, Link Summon Tri-Gate Wizard in the 4th Main Monster Zone (below Firewall Dragon). As SPYRAL Double Helix that both Firewall Dragons were pointing to was sent to the graveyard, trigger the effect of both Firewall Dragons, forming a Chain. There is also a D.D. Crow in hand for graveyard disruption. Xyz Summoning Lyrilusc – Recital Starling is optional. 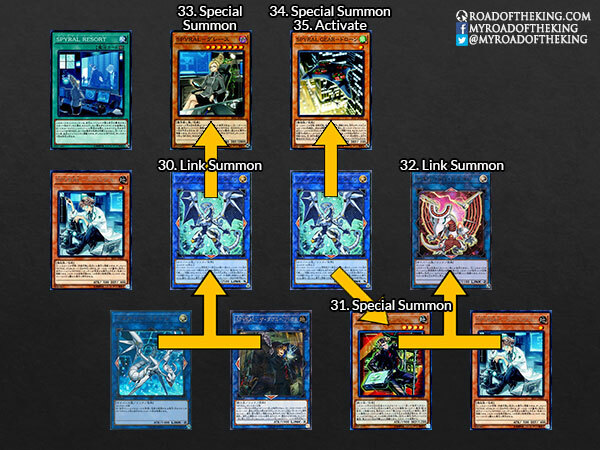 Step 32, 35, 36, 37 can be skipped, and in Step 39, use SPYRAL Quik-Fix + SPYRAL Double Helix to Link Summon Tri-Gate Wizard instead. SPYRAL Quik-Fix would be banished in this case, but you would end with a SPYRAL GEAR – Drone in hand. As the Extra Deck space becomes tighter with the new inclusion of Saryuja Skull Dread, most players have chose to run only one Rank 1 Xyz Monster – Sylvan Princessprite. All Basic and Intermediate Combos can still be executed with Sylvan Princessprite in place of Lyrilusc – Recital Starling. You will end without D.D. Crow in hand, but there is the chance that Sylvan Princessprite might excavate a Trap Card such as Solemn Strike or Artifact Sanctum, especially after Side Decking. Thanks for the combo article! SPYRAL seems complicated at first, but after a while you realize most of the combos end in the same way. @Razmus, you might be mistaken; this is an OCG website, the TCG Forbidden and Limited List have no bearing on us.